The verdict is finally in. NBC has renewed its Trial & Error TV show for a second season of 10 episodes. Writers Jeff Astrof and Matt Miller executive produce the comedy along with director Jeffrey Blitz. Expect Trial & Error, season two, to premiere mid-season. The first season of Trial & Error stars Nicholas D’Agosto, John Lithgow, Krysta Rodriguez, Steven Boyer, Jayma Mays, and Sherri Shepherd. The NBC sitcom centers on newly-minted NYC lawyer Josh Segal (D’Agosto). In season one, Josh had to defend the eccentric, “rollercizing” poetry professor, Larry Henderson (Lithgow). Trial & Error creators Astrof and Miller said, back in January, that they are approaching the crime spoof as an anthology series. This makes sense, as Larry’s trial is over. According to Deadline, everyone from the season one cast is returning, except for Lithgow. Last week, NBC Chair Bob Greenblatt said he was hoping to have good news about the Warner Bros. sitcom. The first season of Trial & Error averaged a 0.92 rating in the 18-49 demographic and 3.86 million viewers. When you compare its ratings to those of other NBC TV shows, the renewal is a bit of a surprise, but the Peacock Network must have faith in it. The Trial & Error Twitter page announced the second season renewal. Check it out. Murder board… Murder board…MURDER BOARD! MURDER BOARD! What do you think? Did you watch the first season of Trial & Error? Did the NBC season two renewal surprise you? Let us know, below. Trial & Error: Is the NBC TV Series Cancelled or Renewed for Season Three? Trial & Error: Cancelled or Renewed for Season Two on NBC? 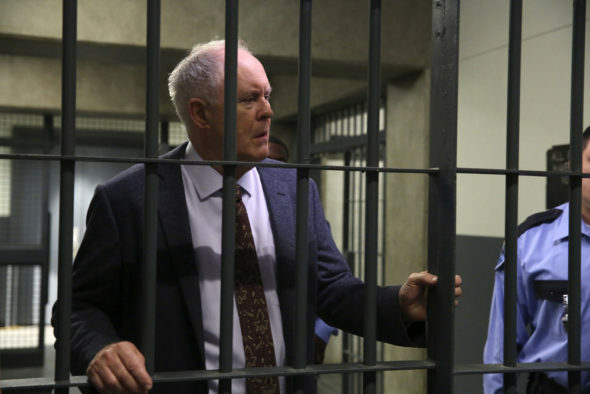 Trial & Error: Will John Lithgow Be a Regular in Season Two? Trial & Error: Season Two; Would You Keep Watching the NBC TV Show? So waiting for season 2. What unique writing in a sitcom. Love it! Without John Lithgow, this show seems almost pointless. I just read that John Lithgow won’t be returning. I think that’s a mistake. Loved this show and just reached it. Wondered if there would be a season 2 and I’m so happy! This show is the first sitcom to make me laugh out loud in YEARS! I am looking forward to the next season and curious to see who will need the service of this zany law team. Lithgow will be a hard act to follow!